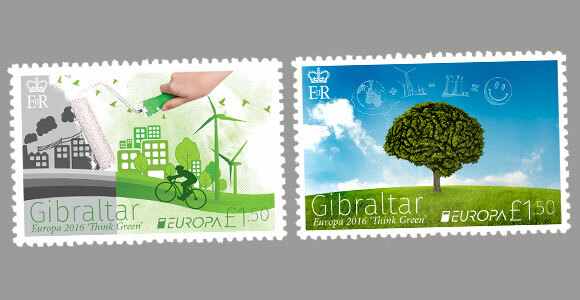 This year’s theme ‘Think Green’ stamp issue from Gibraltar features two stamps. The fi rst stamp features thewinner of the PostEurop “Think Green” joint design competition, a design from Cyprus Post artist, Ms. DoxiaSergidou which was chosen amongst 24 outstanding entries. “The main purpose was to show that it is in our hands to create a greener planet. Thus, I have placed a handon the top side of the stamp which basically represents anyone of us, actively replacing the grey colour(the environmental pollution) with the green colour which symbolizes environmental living and hope, andin turn inspire us for a better world. The left side of the stamp represents the polluted side and is paintedgrey showing us the tremendous disaster caused by the industries, automotive vehicles, power generationand ineffi cient waste. It also shows how the human activities are negatively infl uencing the environment.In contrast on the right side of the stamp, is the green side which show us how using renewable energyresources, acting in a more environmental way and becoming more environmentally aware could positivelyaffect the environment. This will not only have a positive effect in our generation, but it will also help thefuture ones to co-exist in harmony” adds Ms. Sergidou. The second design features an illustration of a human brain represented as tree leaves with sketchedthoughts of how to think and act ‘green’ created by Giordano Aita.